Beginners, Intermediates, Advanced, all are welcome! Location: El Toro's 1st airtime hill. I couldn't find a thread using the search button, so if it exists, than I'm sorry. As the description states, no matter what your skill level is, you can join the conversation. The uses of this thread are to share your experiences, videos, photo's and even advice to newcomers to the sports of Skiing and Snowboarding. I'll begin by saying that I am a snowboarder, and took my latest trip to Big Boulder Ski Resort, in PA. Great pow, great terrain parks, and an awesome atmosphere, I have to say that it is one of my new favorite mountains. Other favorites include Blue Mountain, Camelback Mountain, Shawnee Mountain, and Jack Frost. I won't stop riding roller coasters when I get old. I'll get old when I stop riding roller coasters! For some Winter fun, click here, for My New Snowboarding Music Videos! Mt. Baker is my home mountain> I don't think we have a terrain park, but there is a halfpipe that is slowly getting filled in by the huge amounts of snow. ^.^ If you think a PA resort has tons of powder, then you need to come take a trip to Mt. Baker! Other mountains I have been to include Whister Blackcomb, and Grouse Mountain. None of the other mountains I've been to even come close to Baker though. I've only been snowboarding once and very much enjoyed it. Scared me (and gave me a bigger rush) more than any roller coaster ever could. I'd definitely like to take more lessons and do it more in the future. ^ Wow, did it really? I never had any desire to go snowboarding, but I think now I want to do it at least once. along with riding coasters and traveling, snowboarding is another passion of mine. I've been riding for about 16 years. It's one of my favorite things to do to just get away from everything. There's nothing better than riding chairlifts up the mountain when it's dead silent, especially at night. So peaceful. I used to love riding park; half-pipe in particular. But, after many years of skateboarding and being an idiot on my snowboard, I can no longer do that stuff, as my knees are shot! Now, I just cruise around and have a good time, maybe bump off a few hips here and there. I used to manage a skate shop that sold snowboard gear, so I used to get hooked up with stuff all of the time. Reps would hook me up, I'd get things at cost, and I used to go to this thing called Test Fest, where you would test out all of the new products for the next year to see if you want to carry them at your shop or not, and could ride with some pros. It was awesome! But the best thing about working at the shop was that we got free lift passes to every place in the state, every season. I used to ride every single weekend in the winter, and some weekdays. The shop closed about 9 years ago, and I've only been able to go a handful of times since then (Maybe once or twice a season). I definitely miss it! Plus, I'm still using my old gear that I got when I worked at the shop. It may be old and out of style, but it still works, haha. I would LOVE to do one of the TPR winter trips out west one of these years. 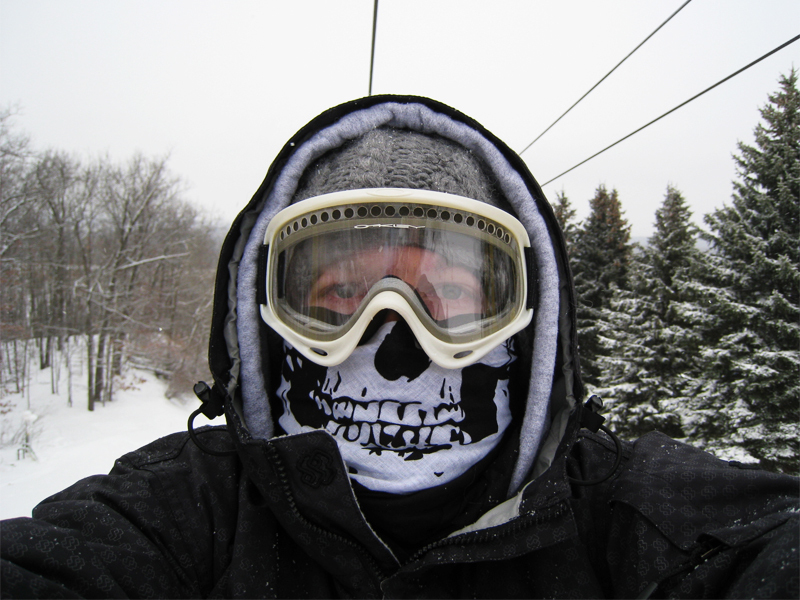 Here's a pic of me from a few years ago, riding the chairlift. I think that I can agree, as a snowboarder of almost 6 years, that yes, it is to me at least, more of a rush than roller coasters. You can basically create your own layout as you go! I was just talking with some friends last night about skiing. I have never tried it, but being that I live in an area where it's winter five months out of the year, it might be worth it for me to learn! I definitely want to get out to Holiday Valley and ride the mountain coaster this year, but would also love to try the tubing there and get an all day ski pass. Getting a weekend room there would be great too, but I hear that it's VERY expensive. Yeah, I know from experience that snowboarding is not a cheap sport at all. If you can find the right group of people to go with though, it can be the time of your life. I highly recommend anyone trying it at least once or twice. If you need a little incentive, heres a video of my most recent trip. Enjoy! Snowboarding is the best thing in the world (sorry rollercoasters). I have lived in the Tahoe area most of my life, and my parents started me skiing at the age of 2. I switched to snowboarding in High School and haven't put skis on since. I'm actually spending new years eve snowboarding then going to watch the fireworks, then spending the night in a cabin. I'm going to snowboard on new years day as well (we'll see how that goes). I'm pretty excited as in a couple weeks I'm going on my first real 'ski trip' to Colorado. I've never been anywhere outside CA/NV and OR. I will be going to some of the Vail resorts and maybe some other ones as well. If anyone has any tips about those mountains let me know. Last edited by SLUSHIE on Fri Jan 04, 2013 6:20 pm. I've never tried snowboarding, but I love skiing! Unfortunately, it's been a terribly long time since I last went. That was at Snowshoe in West Virginia (love the lodge and village being at the top of the mountain). I was there on a New Year's Eve when it came a huge snow storm, so my buddy and I got snowed in and had to spend another day skiing (darn!). One of the best New Year's Days ever!